COMPANY PROFILE Rio Tinto PLC is a mining and exploration company. It discovers, mines, processes and supplies metals and minerals used in everyday modern life. Its main products include Bauxite, Alumina, Copper, Gold, Molybdenum, Silver, Nickel, and Diamonds. Rio Tinto searches for and extracts a variety of minerals worldwide, with the heaviest concentrations in North America and Australia. Iron ore is the dominant commodity, with meaningful contributions from aluminium, copper, diamonds, energy products, gold, and industrial minerals. The 1995 merger of RTZ and CRA, via a dual-listed structure, created the present-day company. The two operate as a single business entity. Shareholders in each company have equivalent economic and voting rights. 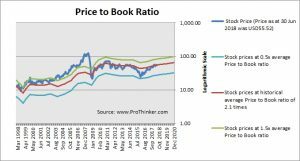 At the price of USD55.52 as at 30 Jun 2018, Rio Tinto Plc is trading at a Price to Book Ratio of 2.1 times current book value. 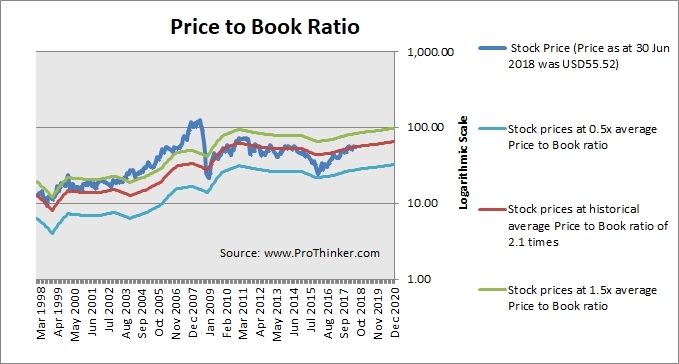 This is a 17% premium to its historical average Price to Book Ratio of 2.1 times.